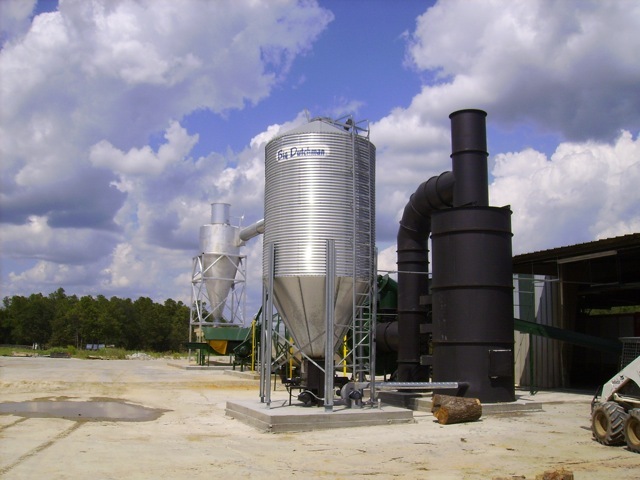 Jackson began selling Webb Burners® over ten years ago, to answer the need for a more economical way of drying wood shavings. Now, in cooperation with inventor and physicist W. B. Webb, we manufacture a complete line of biomass burners available in sizes up through 60 million BTU/hr. These cyclonic suspension burners are ideal for generating large quantities of heat for industrial processes, at substantially less cost per BTU than traditional oil- or gas-fired systems. They may be fired with a variety of solid fuels including sawdust, corn cobs, sunflower hulls, flax shives, pelletized wood, charcoal, peat, and coal dust. Moisture content must be less than 20% and maximum particle size is 1/2". Fuel is augured out of the storage bin by the fuel feeder unit, and blown into the biomass burner. There, complete combustion occurs in semi-suspension within seconds, resulting in emissions rivaling those of natural gas burners. There is no smoke (except when the fire is first lit), and carbon monoxide, VOC, SOx, or NOx emissions are extremely low. In addition, the extremely rapid combustion process allows quick response to changing process loads. Hot gases from combustion exhaust into the hot gas transfer duct at the top of the biomass burner, and are drawn through the duct into the downstream process by induced draft fan(s) in the same manner as with a traditional fossil-fuel burner. Complete biomass burner control panel provides automatic modulation of firing rate based on process outlet temperature (or other appropriate process parameter), and monitors burner and process inlet temperatures for safety shutdown in case of temperature extremes. Controls are approved by all major insurance underwriters. The first Webb Burner® was developed and installed by Mr. Webb in 1979, and there are many units currently in operation in various applications across the country and around the world. We will be happy to arrange a visit to see one in operation.